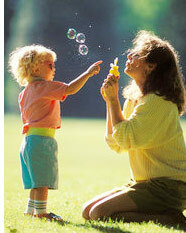 Playing with your toddler is one of the best ways to help encourage his emerging activity and developmental skills. Whether you read, color or run around with him, remember that all childhood play has some educational value in it. Of course, there are certain activities you can do to promote particular skills. Learn more now about what you can do to further develop your toddler's skills and find out which activities will better help you child bloom. Our article on Reading to Your Child has some helpful parenting advice to help you encourage this necessary skill in your child. To get your child even more excited about reading, take a look at Learning to Read: How to Inspire Your Child. Reading not only will help your child later to do well in school, it can also help to enhance your child's imagination and creativity, help to develop listening skills, and teach your child valuable lessons. Looking to turn your toddler into a social butterfly? Play Dates has just the tips and suggestions you need to make sure all of his social interactions are successful. Interaction with other children is a great way to teach your child social and communication skills and to introduce your child to ideas and cultures different from his own. This section has all the parenting information you need to help your toddler get the most out of his activities. Start reading now and find out how to get the most out of activities with your child. And don't forget to enjoy doing the activities with him!